The American pika, a cousin of rabbits and hares found in the mountains of western North America, may serve as a model organism for examining the effects of global warming on montane species. Pikas tend to live on talus slopes at higher elevations, and as their lower elevation limits are relatively high they may be especially vulnerable to climate change. Having adapted to colder climates pika are susceptible to hyperthermia in the summer, with a lethal upper body temperature occurring at only 3°C above their resting body temperature. During times of high temperature pikas reduce their foraging time to keep their body temperatures low, which also reduces their energy intake. Prolonged periods of high temperature can lead to reduced reproduction and death. 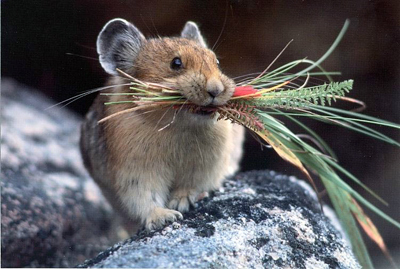 Summer temperatures can thus place serious limits on the pika’s distribution. Stewart et al (2015) created a model to assess the potential risk posed to piks and other climate-sensitive mammals by climate change. Their model matched previous findings and predicted high levels of extirpation of pikas in study sites across California, with the size of talus area and summer temperatures being the best predictors of range. The study was conducted across 67 sites in California with historical records of pikas, which were resurveyed to determine current pika presence. Pikas no longer occurred in 10 of these sites, with several other sites displaying only a small presence of the species. Pika viability was modelled as a function of environmental variables, resulting in 58 combinations which were tested for predictive power. The best performing model was based on the variables of talus area and mean temperature, which correctly hindcasted pika presence at 94% of sites. The model was then used to make predictions of future distribution under the increasing temperatures predicted by the IPCC. By 2070 overall extirpation of the sites is expected to range from 39% to 88%. The authors warn however that their model may underestimate extirpation due to the involvement of other environmental factors. Similar findings of range being linked with mean summer temperatures has been found across the pika’s range, which does not bode well for the species’ future. And as the vulnerability to summer temperatures is shared by most high-elevation species, we face the risk of seeing these species ‘pushed’ off the tops of mountains by rising temperatures. The paper calls for greater monitoring of such species in the future. This entry was posted in Behavioral Response, Ecological Range Shifts, Kyle Jensen and tagged Climate change, Cody P. Massing, Constance I. Millar, David H. Wright, global warming, historical resurvey, James H. Thorne, John D. Perrine, Joseph A.E. Stewart, Kenneth E. Goehring, Lyle B. Nichols, metapopulation, Ochotona princeps, pika, range shift, species distribution modelling, talus by Emil Morhardt. Bookmark the permalink.